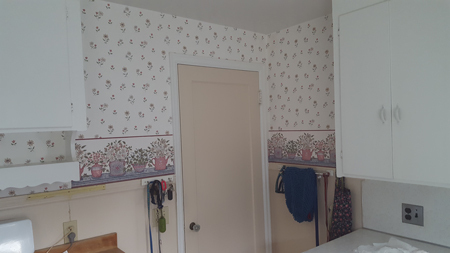 When I moved into this sweet little house 3 years ago, I knew that I didn’t like the wallpaper and paint in the kitchen. Although there’s a dark alcove, most of the room is nice and bright with a large bow window, so I could ignore it for a while, but not forever. For several months I thought I’d strip the wallpaper myself and paint. Finally I realized I’d much rather pay someone to do that. I used the NextDoor app and got some recommendations, ultimately choosing a GREAT small, local firm, Stamp Paints. Josh and Kay were a pleasure to work with, very responsive, professional, and reliable. In addition, they are dedicated to giving back to the community and make donations of both money and time regularly. Well. I cannot stress enough just how happy I am that I hired Josh to do the job. Under that first layer of wallpaper, which came off relatively easily, was paint over another layer of wallpaper. And paint over a third layer of wallpaper under that! Hours and hours spent by a professional would have translated to days and days and curses and frustration and anger and hatred if I’d been doing it myself. After the wallpaper was removed and minor repairs made, Josh painted the walls. The chair rail and below are a lovely blue (Sherwin Williams Ebbtide); above is a nice green (Sherwin Williams Breaktime). 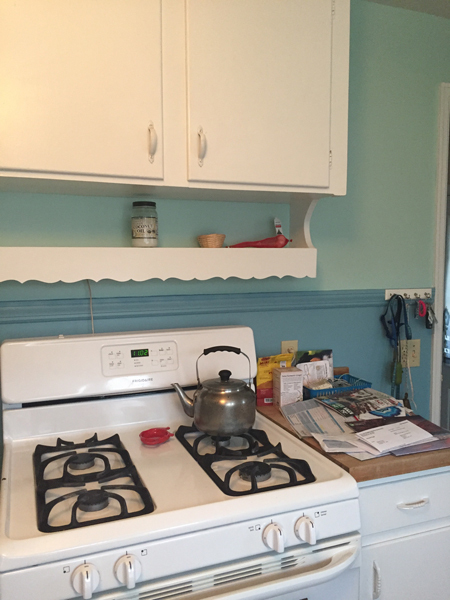 I left the cabinets and other trim white for now, and painting the doors was not part of his bid, so I still have to paint the kitchen side of the two doors. I’ve just been too busy weaving to get to it. There will be time this winter; that’s my story and I’m sticking to it. 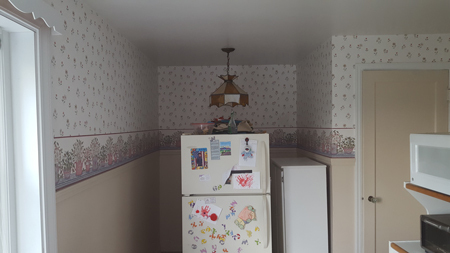 I also want to replace that light fixture by the refrigerator with something that ‘fits’ the rest of the room, but that would require going to a store and shopping. Ugh. I really like the new look – except for my mess on the counter. After I paint the doors I plan to paint my bathroom, too. We’ll see when that happens, as I’ve committed to some painting at my daughter’s flip house and my son’s new home. Such soothing colors! Love the update. I envy you your gas stove……. What color will the cabinets be or is that still to be decided? 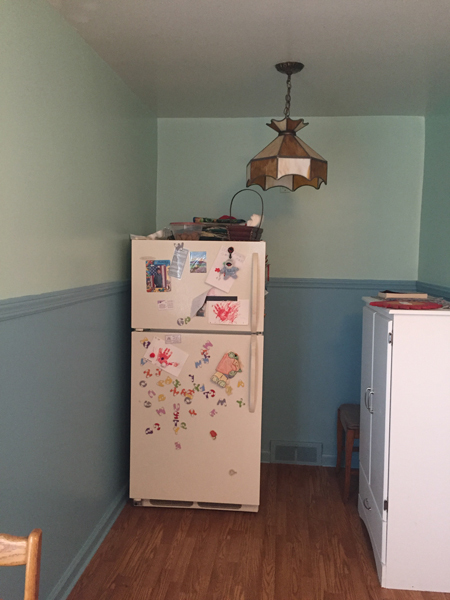 I don’t plan to paint the cabinets this year. Maybe next summer? I’m thinking about a soft gray, but am totally open to suggestions. Have you considered becoming a volunteer firefighter with your spare time? Or maybe a parachute jumper? You have time to commit to painting at two more houses now? OMG!! How’s the weaving coming along? I hope you’re catching up with yourself by now. I do agree that Josh did a FINE job. It was really time to let a professional take a project off your hands! I’m glad you did it this way. There isn’t, by any chance, a 4′ length of chair rail left over, is there? Painting at one of those houses is on a deadline, that has been pushed back and pushed back. Now it’s here, and so are the holidays. It will happen. Painting at Michael’s new house isn’t a hurry…some of it will of have to wait till the spring. My chair rail was already there; nothing was added. But I’m sure you could buy 4′ of chair rail at Lowes or Home Depot. I love the new colors in your sweet kitchen. Thanks, Cindie. Step one. Several steps left in that redo.